The River Conwy is joined at Betws-y-coed by the River Lledr and the River Llugwy and it is the latter that provides the route of the A5 (Telford's old London to Holyhead trunk road - the Irish Mail coach route) upwards through the village to the Swallow Falls, Capel Curig and the Nant Francon Pass to Bethesda and Bangor. The Swallow Falls on the Afon Llugwy between Betws-y-coed and Capel Curig. Here in the delightful Snowdonia village of Capel Curig (about four miles from Betws-y-coed), near the junction of the Nant Ffrancon and the Pen-y-Gwryd roads is an ancient church Eglwys Santes Julitta now in the care of a local charitable trust. In pre-Norman times the dedication of this church was probably to Saint Curig, a Welsh Bishop of the 6th Century. Later the name became Latinised to Cyriacus and identified with Saint Cyricus who with his mother Saint Julitta was martyred at Tarsus c304 AD. Probably known by the end of the 12th century as Saints Cyricus and Julitta, it later became known just as Saint Julitta. 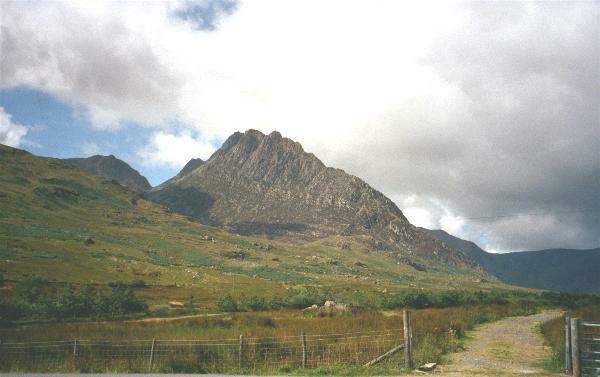 Tryfan near Ogwen in the Nant Ffrancon Pass. Photographs © 2004/7 by Noel Walley. Updated December 2008.